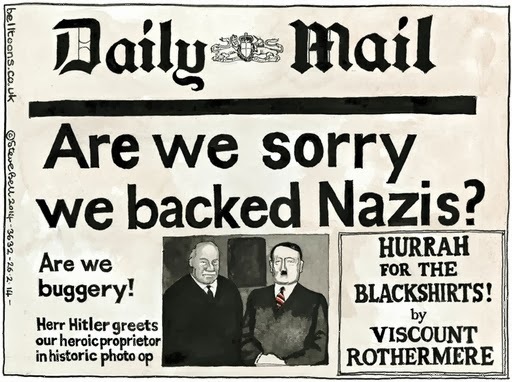 John's Labour blog: Is the Daily Mail "Sorry" it backed the Nazi? Superb cartoon in Guardian by Steve Bell. A response to the deliberate Tory smear attacks on Harriet Harman.Hat tip Ravi. (Daily Mail owner) Lord Rothermere was a friend of Benito Mussolini and Adolf Hitler, and directed the Mail's editorial stance towards them in the early 1930s. Rothermere's 1933 leader "Youth Triumphant" praised the new Nazi regime's accomplishments, and was subsequently used as propaganda by them. In it, Rothermere predicted that "The minor misdeeds of individual Nazis would be submerged by the immense benefits the new regime is already bestowing upon Germany". Journalist John Simpson, in a book on journalism, suggested that Rothermere was referring to the violence against Jews and Communists rather than the detention of political prisoners. Rothermere and the Mail were also editorially sympathetic to Oswald Mosley and the British Union of Fascists. Rothermere wrote an article entitled "Hurrah for the Blackshirts" in January 1934, praising Mosley for his "sound, commonsense, Conservative doctrine", and pointing out that: "Young men may join the British Union of Fascists by writing to the Headquarters, King's Road, Chelsea, London, S.W." Well, the issue is the Daily Mail's shrill hypocrisy, now and then, not the sins of the father. The cartoon was...a cartoon. Poking fun at the obvious Conservative Party planted smear against Harriet. The same as that against Ed Miliband's Dad. Dog whistle, nasty party politics at its worse.